WARSAW, Poland -- They have been in limbo for weeks, nervously watching for a flare-up in the conflict and praying for a swift rescue. “In the evening, the city dies, and no one leaves their homes. Everyone here is afraid for their life,” Victoria Kharchenko, a Ukrainian of Polish descent living in Donetsk told Polskie Radio last week. Clutching a single large suitcase and proof of their Polish heritage, some 200 people of Polish descent will be airlifted out of Ukraine’s war-torn east in the coming days in a rescue mission arranged by Warsaw and charged with political and historic undercurrents. The evacuees have been promised a one-way ticket out of the nine-month long conflict between Ukrainian forces and pro-Russian separatists, and a new life in a country they may never have previously visited. One of the EU’s most vocal supporters of Ukraine in its conflict with pro-Russian forces, Poland will become the first European nation to attempt an evacuation from the contested region, as it seeks to promote itself as a key actor in the events determining the future of the country. “Ukrainians are seen by the Poles as important neighbours, people very similar in terms of language, culture,” said Jaroslaw Cwiek-Karpowicz, head of research at the Polish Institute of International Affairs. Despite multiple delays, officials in Warsaw this week insisted the evacuation was imminent, saying that they have specifically targeted the days before planned ceasefire talks on January 15 in Astana, when the conflict will probably be subdued. “We are entering the decisive phase,” said Marcin Wojciechowski at Poland’s foreign ministry, which is co-ordinating the airlift. A specific date for the evacuation, which will cost about €1million ($1.18 million), has been kept secret for security reasons. The separatists may try to stop it or use it as an opportunity to attack representatives of an EU and NATO member state. The rescue comes just weeks after Warsaw sent 40 trucks filled with food and humanitarian equipment to the conflict-wracked region, where a ceasefire agreed in September has failed to quell the fighting that began early last year and in which almost 5,000 people have been killed. Neighbours and cultural cousins, Ukraine and Poland share centuries of history, with hundreds of thousands of people on both sides of their 330 mile long border claiming joint heritage. But the two countries, which have also fought, invaded and attacked each other, share a bloody and painful history of forced repatriation across their frontier, most notably with the redrawing of eastern Europe’s boundaries in 1919 and 1945 and the subsequent, often violent, resettlement of people between countries behind the Iron Curtain. Ukrainian president, in an address to the Polish parliament last month, cited both the two countries’ similar “souls and languages”, but also their “animosities and arguments . . . [and] episodes we would not like to even remember”. The plight of those with Polish heritage caught in the crossfire between soldiers battling for control of eastern Ukraine has become an emotive political issue in Warsaw. Last year nationalist opposition politicians attacked the government for its perceived inaction, sparking debate over Poland’s role in the region and its responsibility for the safety of its diaspora. “[Today] Ukraine has become for some people in Poland a symbol of freedom . . . They feel like we have to fight for freedom in our neighbourhood,” said Andrzej Szeptycki, assistant professor at the University of Warsaw. Fears that an evacuation mission would be attacked made the Polish government reluctant to act. But the debate over the merits and risks of an evacuation became moot on December 3, when a Polish citizen who had been living in Donetsk for more than 25 years died after being shot by separatists. His death forced Warsaw’s hand. Prime Minister Ewa Kopacz initially promised that the evacuees would be in Poland before Christmas, a pledge that was pushed back to the end of December and then into January. 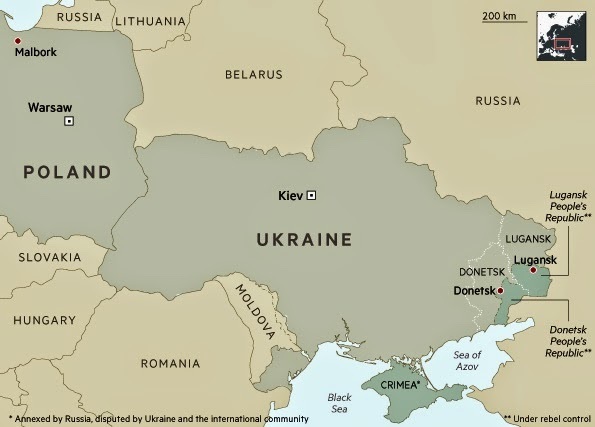 Last weekend, congregations at Roman Catholic churches in the Donetsk region were told to be ready to evacuate soon, while the Polish consulate in Kharkiv has opened a telephone helpline to allow potential evacuees to confirm their seat on the airlift. Those requesting evacuation must either be holders of a Karta Polaka — an identification card issued to people with Polish heritage — or be able to provide other proof of Polish parents or grandparents. At one stage, as many as 4,000 Poles, initially attracted to the region by its heavy industry and coal deposits, were estimated to live around Donetsk. But many have already left and by January only 205 people qualified for the airlift. Wary of the risks of sending official representatives into the area controlled by pro-Russian forces, Poland has instead requested the evacuees make their way west into Ukrainian-controlled territory, from where they will be taken by foreign ministry officials to aircraft commissioned to fly them to Malbork, a military airfield in northern Poland. Upon arrival, the migrants will be given six months of free accommodation, language and adaptation courses, school places for children and professional training to enable them to find jobs and permanent housing in the country. “We will do it, we are enthusiastic about it. We are happy that persons of Polish origin will be able to feel safe in Poland,” said Poland's interior minister Teresa Piotrowska.